Interrupting my seemingly daily reviews with a treat I found over at Trashionista. I remember Chachic posting about bookish clutch bags and necklaces, and I’m sure there are bookish t-shirts too…but how about a bookish dress? 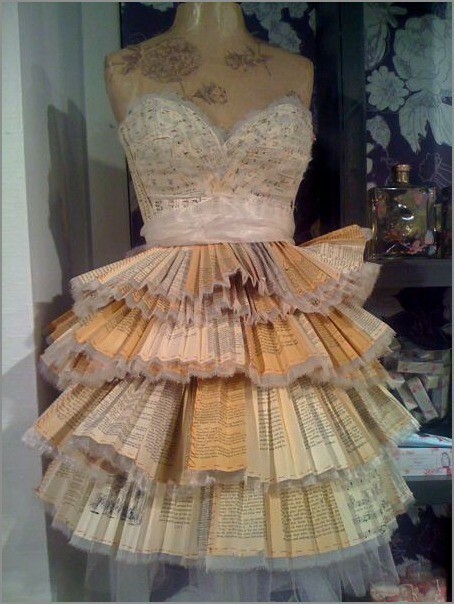 Moreover, a dress made of books? It’s cute, right? But I’d have to agree with Trashionista — I’m not sure how wearable this is. I’m pretty sure there’s a cloth lining inside so the paper won’t be destroyed, but I think this would not last long during summer time here in the Philippines, with our humid heat and all. If you could assure me I’ll be in an airconditioned room the entire time I’m wearing this, then maybe it would be wearable. It’s so cute, right? :) It’s something a book lover would even consider getting. Haha. Better not drink too! ..gorgeous dress.